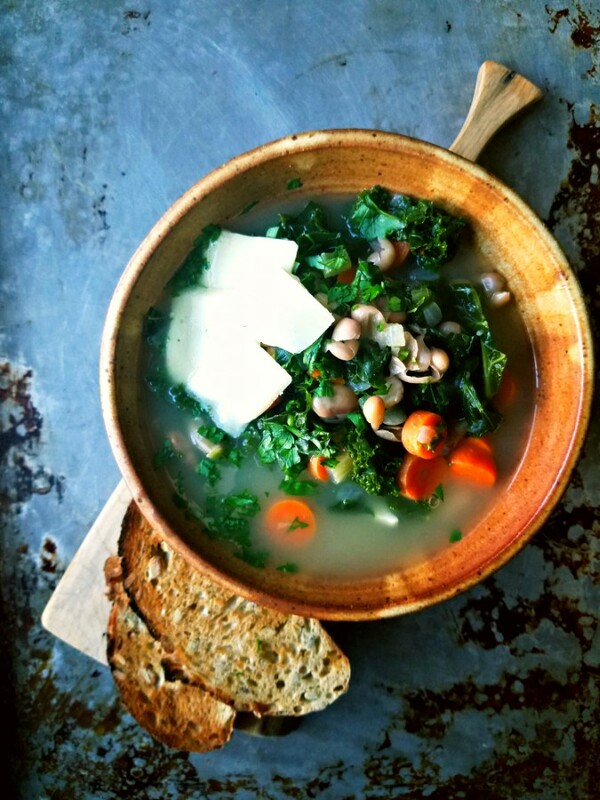 If you need a reset after the countless cookies, pies, cakes, and who knows what else you ate over the holidays, this Pinto Bean & Kale Soup is for you! The soup takes less than 30 minutes to make and is full of flavor, vitamins, color, and still fits the comfort food label. I used defrosted pinto beans from Camellia beans I cooked in my pressure cooker and defrosted chicken broth. If you want to make this soup vegetarian, substitute vegetable broth. For a vegan version, leave out sharp cheddar. 1. In a large soup pot, heat olive oil. Add onion, carrots, celery and garlic. Season with salt and red pepper flakes and saute for 10 minutes on medium heat. 2. Add kale. Saute for a few minutes until kale has wilted. 3. Add beans and chicken broth. Bring soup to a boil. Lower the heat and simmer for 10 minutes. 4. Serve topped with parsley and cheese and a side of toast. This soup keeps well for days in the refrigerator and is great as leftovers. 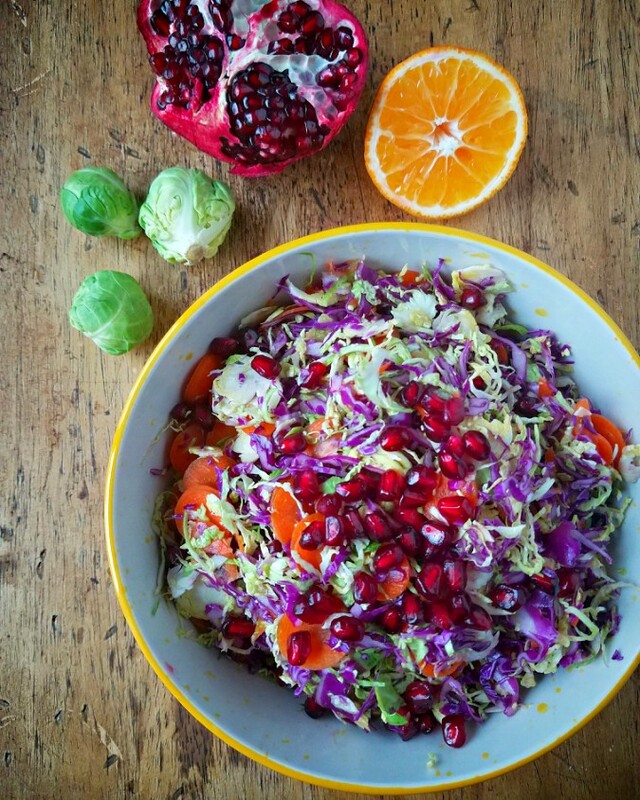 I had a bunch of produce from my latest Washington's Green Grocer order and instead of roasting the Brussels sprouts and making a cabbage soup, decided to thinly slice all the vegetables and mix in the beautiful pomegranate arils. For the dressing, I used tangerine juice, olive oil, and whole grain mustard. You can use as little or as much of each of these ingredients depending on how spicy or sweet you want the dressing to be. In fact, feel free to add a bit of honey or lemon juice. Also, I used a food processor to shred my vegetables. You can use a knife or a mandoline if that's what you have. 1. Combine the vegetables in a very large bowl. 2. Sprinkle most of the arils on top, season with salt and pepper and drizzle with olive oil, tangerine juice and top with a few tablespoons of whole grain mustard. 3. Gently mix to combine: you don't want to crush the pomegranate arils. 4. Serve in individual bowls topped with extra arils. If you think salads are only for hot-weather months, think again. Bulgur Winter Salad With Preserved Butternut Squash, Cotija, And Smoked Almonds is bursting with color and a combination of sweet, salty, and crunchy flavors that will make the winter blues go away if only for a short while. A few months ago I took Domenica Marchetti's workshop to learn about preserving. 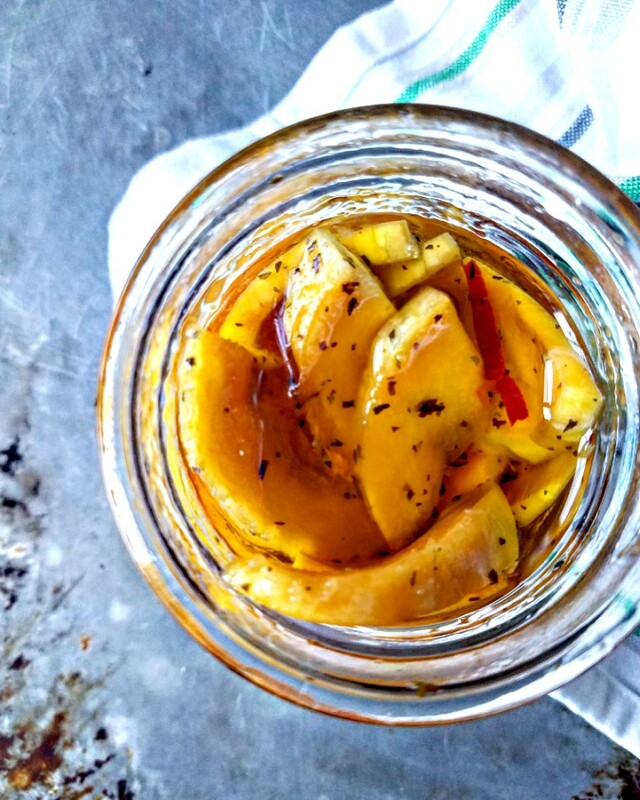 One of the recipes surprised me: did you ever consider preserving butternut squash!? Neither have I, but Domenica was correct: preserved squash is such a fun and unexpected idea. The squash retains its gorgeous orange color and crispy texture and is paired with mint and dried chili peppers. You can find the recipe for the squash here, or in Domenica's Preserving Italy book. 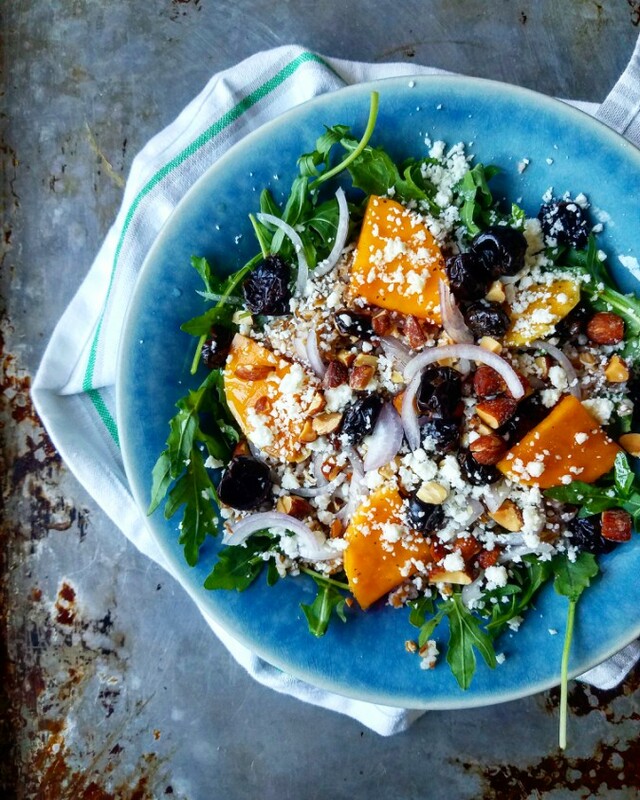 In Preserving Italy Domenica shares a recipe for Farro Salad With Preserved Winter Squash And Dried Cherries, which I adapted and simplified to fit my tastes and the contents of my refrigerator and pantry. I used bulgur instead of farro, smoked almonds instead of hazelnuts, cotija instead of ricotta salata, and left out honey and vinegar. Layer ingredients on a plate or mix in a bowl. 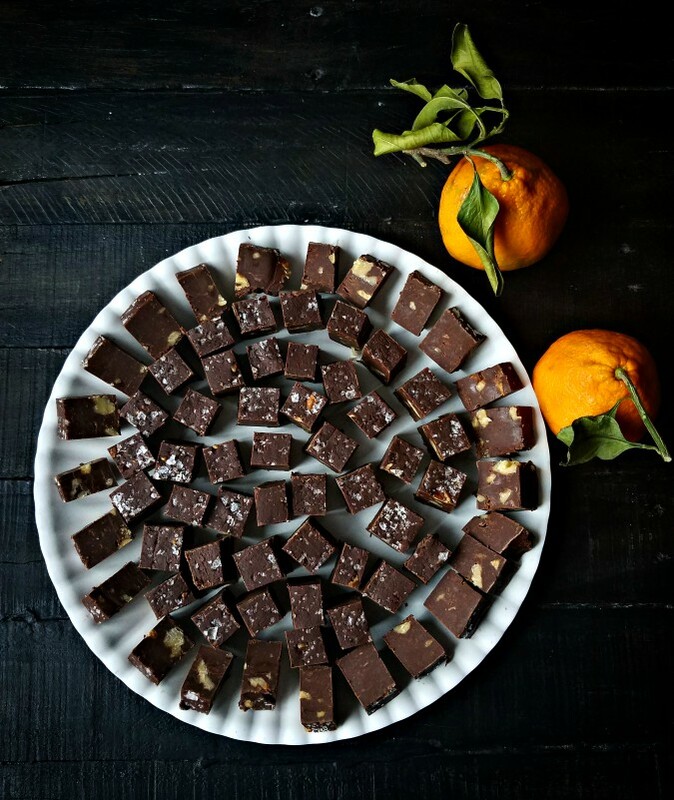 This fudge is totally ridiculously easy to make but will have everyone so impressed! Plus, it's a great no-bake dessert that can be made days ahead, is easy to transport, and can be easily customized with different add ins: nuts, peanut butter cups, m&ms, etc! 1. In a heavy bottomed pot over medium heat melt together 3 cups of semi sweet chocolate and 14 ounces of sweetened condensed milk by stirring constantly. 2. Turn the heat off and add 1/4 teaspoon sea salt and 1 teaspoon vanilla and 1 cup toasted chopped walnuts. Mix to combine. 3. Immediately spread the mixture into a parchment lined 8×8 baking dish and smooth with an offset spatula. 4. Sprinkle with flaked sea salt and carefully press into the surface. 5. Refrigerate for at least 2 hours. 6. Cut into small pieces and share. 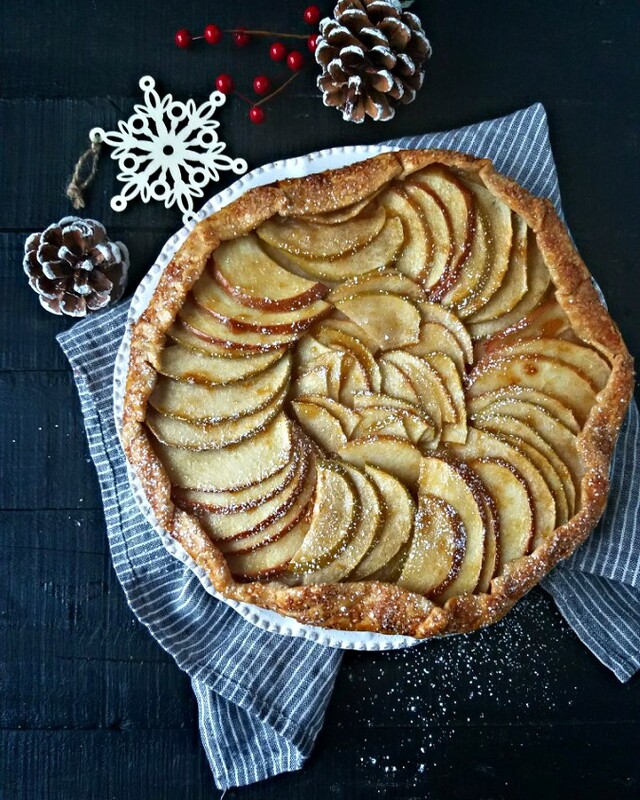 No Soggy Bottom Apple Crostata is a great recipe to make to bring to a friend's house or to have for a casual but impressive dessert. I bet it'd be even great for breakfast with coffee, but I didn't end up with any leftovers to test out this hypothesis. 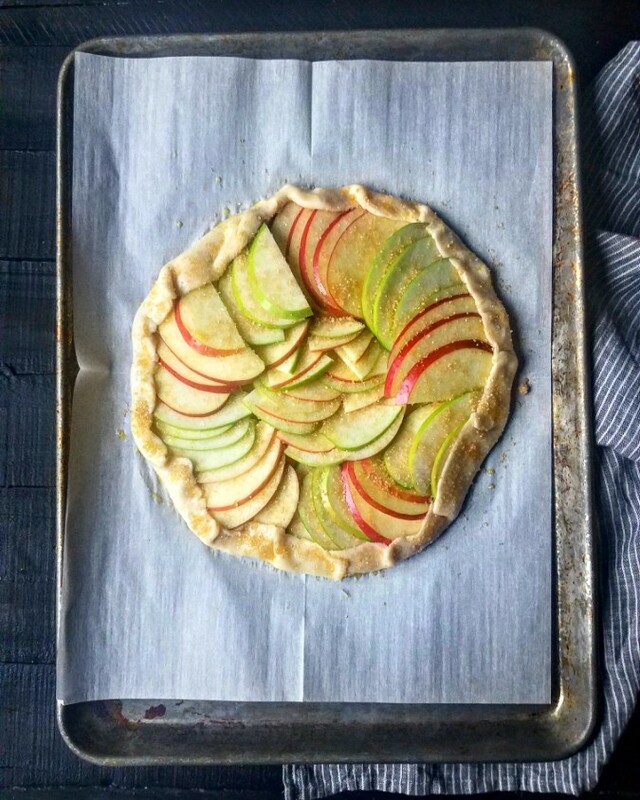 Last week I saw a gorgeous photo of a pear crostata and decided to make one with apples using leftover pie dough from mini chicken pot pies. My biggest concern was WILL THERE BE A SOGGY BOTTOM? You see, I was planning on bringing this dessert to a friend's party and would not know about its success or failure until the actual party. Luckily, the dessert was a complete success, and there was no soggy bottom! 2. Line a baking dish with parchment paper. Roll out your pie crust dough. 3. Arrange apple slices on the dough in a pretty design overlapping slightly and leaving about 1/2" edge. 4. Fold over the edge and brush with the egg wash.
5. Sprinkle the entire crostata with sugar in a raw. 6. Bake crostata for 30 minutes. 7. Remove crostata from the oven and brush the apples gently with the jam. Bake for 10 more minutes. 8. Allow the crostata to cool and sprinkle with powdered sugar (optional). The crostata tasted great at room temperature. The bottom was cooked through and held up well!